This to me, is the definition of the perfect floral jumpsuit. It’s bright and bold, but it still has this very laid back vibe to it. It’s extremely comfortable, yet it feels like I’m wearing something a little extra. I can dress this down, paired with a denim jacket to give it a more casual look or I can wear the jumpsuit on its own, paired with bold heels, bright earrings and accessories that bring out more of a sophisticated look. It’s such a versatile piece that I love so much. 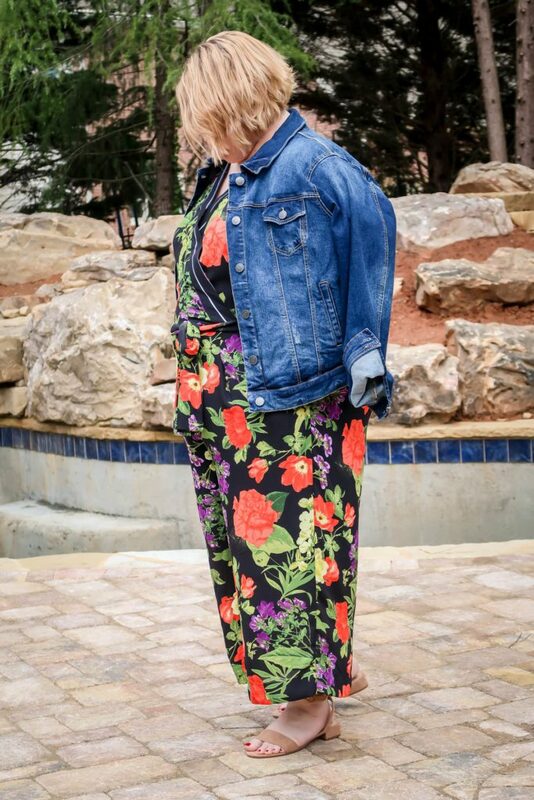 I don’t know about you, but until I put on this jumpsuit, I didn’t think that I’d ever wear one. I’m not really sure why, but I just didn’ think that it would really do much for my body type. Again, I was so wrong! 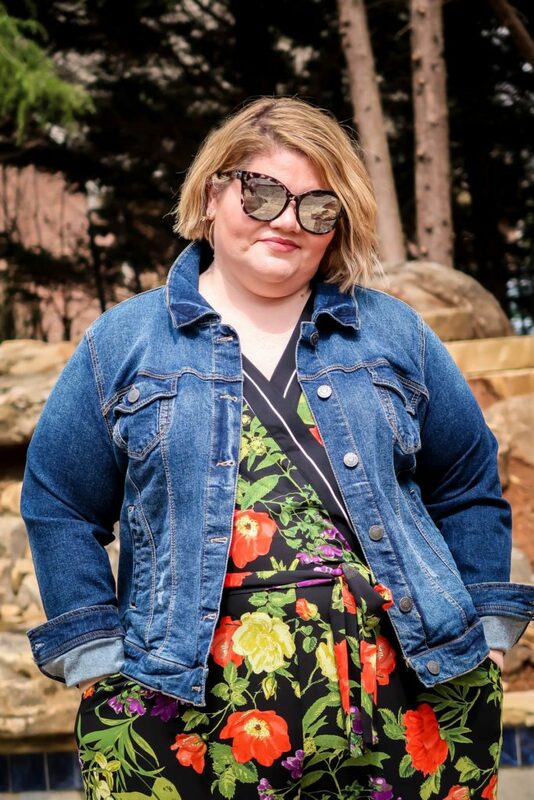 Actually, this jumpsuit makes me feel incredible when I wear it. It fits me perfectly and I find that when I wear it, I feel so sophisticated. The bright pops of colors in this make it the perfect jumpsuit to wear this time of year and thanks to those colors, you can pair this jumpsuit with so many different colored, fun accessories! If you guys follow me on Instagram, then you’ll know that this background is our pool! It’s almost time to fill it up! I can’t wait to photograph more infront of this gorgeous background! A cropped jumpsuit in a bold floral print with contrasting striped trim. Soft, lightweight woven fabric. Hidden snap-button keeps surplice neckline in place. Bust darts. Matching self-tie belt with loops. Pockets. Hidden back zipper with hook-and-eye closure. Lined from shoulder to knee; unlined short sleeves. 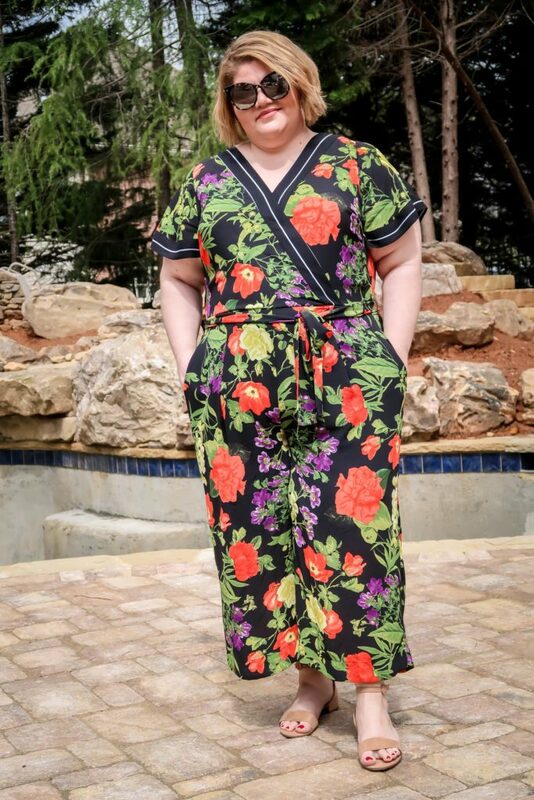 I know that I’ll be getting so much use out of this floral jumpsuit for so many occasions this Spring and Summer. 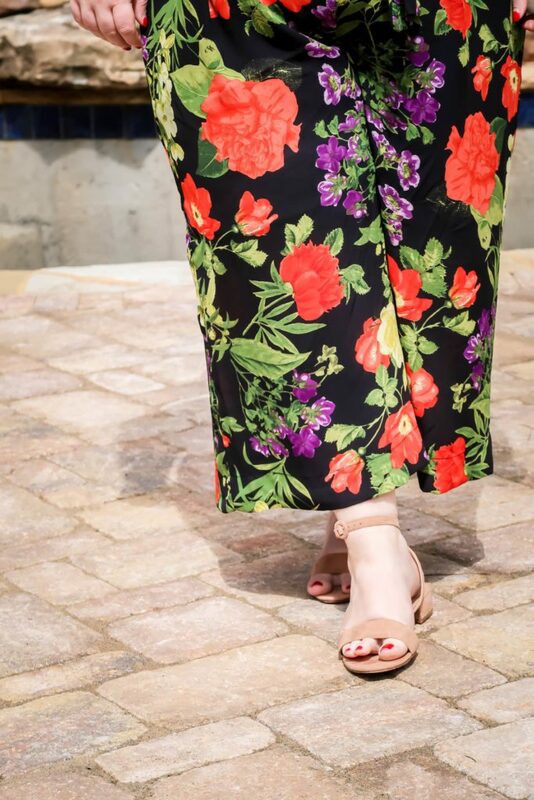 It’s lightweight and the floral pattern and fun colors make it the perfect choice for a casual day or a dressed up date night. It’s as easy as wearing a floral dress, but it is something just a little bit different! Those are the pieces that I love to have in my closet! I’m irritated at myself for thinking I couldn’t “pull off” wearing a jumpsuit. I think we get these ideas in our heads that we have to look a certain way in order to wear certain trends and it’s complete BS! My motto is that if you feel amazing when you’re wearing something, then, by all means, work that trend, honey!!! 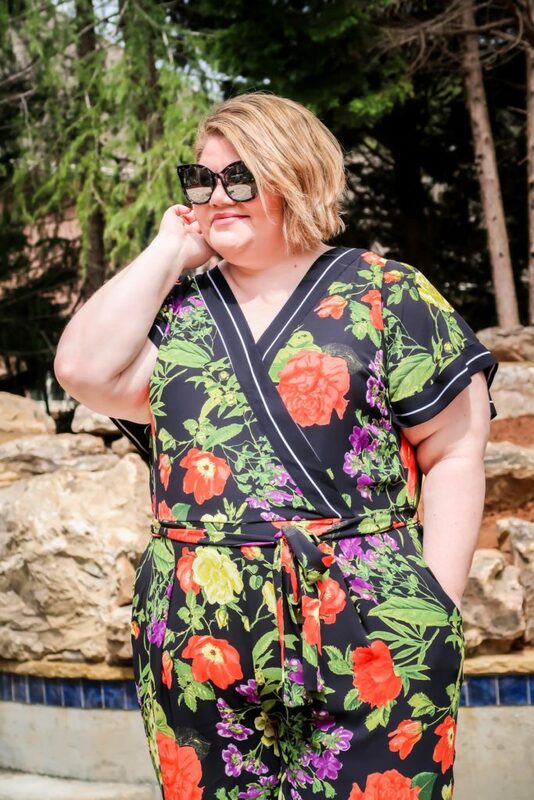 I loved this floral jumpsuit so much that I also ordered a plain black one to have on hand as well. 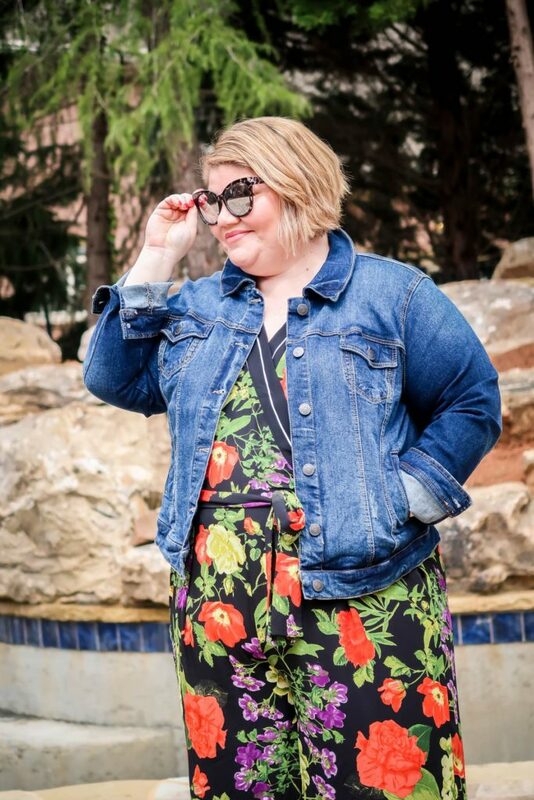 I’m now officially on the jumpsuit bandwagon folks and I think you should try it, too!